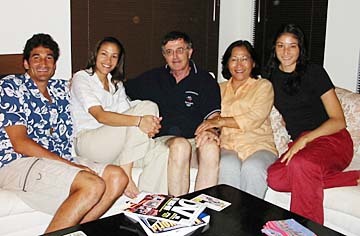 Five national championships are represented in this photo: Mike (one), Mia (one), Vic, Hai Cha and Debbie Lambert (three). It's not unusual for successful athletes to come from the same family. But how often can a family boast of a collection of national championship rings? Vic Lambert tried to name other prominent volleyball families, but he had a hard time identifying one that equaled the success of his brood. With five NCAA championship rings divided among daughters Mia and Debbie and son Mike, the Lamberts' success in the 1990s is unparalleled. The collection is impressive though it has never been assembled. "I've got (my ring) nearby. I don't know what Debbie does with her three," Mike Lambert said. "We want to take a picture where it's just your hand and the five rings. We haven't done it yet. We'll do that some time." It's one of the few things the Lamberts haven't done. All three played collegiately and won national titles at their respective schools. Mia started the jewelry collection when her 1990 UCLA squad captured the national title. Debbie, the youngest, picked up three titles at Stanford and barely missed out on a fourth when the Cardinal lost in the NCAA championship tournament semifinals. Two-time Olympian Mike was the last to get his ring in 1997 after he took a year off from school to play in the Olympics. As youth, Mia, Mike and Debbie dabbled in everything. It was part of being balanced, a lesson that their mother Hai Cha emphasized. The Lambert kids played soccer and took music lessons while growing up. Vic was a professional oboe player with the Honolulu symphony before becoming a pilot and now an engineer for Hawaiian Airlines. "I played the oboe because I had to. It was definitely a great experience to be able to read music," Mia said. "Deb and I took piano lessons when we were younger. "My mom used to preach to us how important it was to be well-rounded and have a variety of activities and talents you can draw from in your life. They definitely bent over backwards to make sure we were exposed to a lot of different things as kids." The Lamberts were exposed to a lot and often at the same time. Mia and Mike say they were a tightknit group growing up though it wasn't always by choice. "When your parents have three kids and one kid has got a practice that ends later, you drag the other two kids along before you go home," said Mike. Which was how volleyball was introduced to the family. Mia set the course for everyone else when she started playing in junior high. Mike tagged along to her practices and used to practice serving an old volleyball against the garage door. He started playing competitively in junior high and received some sisterly advice from Mia. "I remember telling my brother when he was getting started, before he was taller than me, you need to learn how to be a good setter just in case you don't grow, Mia said. "I may have been 5-7 and he was like 5-2, a little pipsqueak guy. Then he grows to be 6-6 ... that's sort of a good joke we always laugh about." Actually, most of the good jokes were directed in Debbie's direction. As the youngest, she took a fine amount of ribbing from her older siblings. When the Lamberts were discussing the ice cream flavors they most resembled, Debbie didn't get to pick hers. "Mike and l looked at each other. We're like 'you would be eggnog.' She has fairer skin than (us). She hated it. We thought it was the funniest thing on the planet. And to this day she still can't stand it that we called her eggnog. Mike is really into that." But Debbie usurped her older siblings by winning the most national championships. And in an informal family poll, she was considered the best athlete of all the kids. "Debbie is (the best athlete)," Mike said. "She was a super stud in volleyball and track and field. She's the smartest, most creative, nicest, cleanest and won all kinds of stuff for track and field and volleyball. She throws a football better than me." And being the youngest did reap a few benefits. Mia had the toughest route to collegiate volleyball. The 31-year-old had to "pound the pavement" to play in college. She contacted coaches and sent rough videos of her games to the colleges she wanted to attend. Mia was accepted into UCLA and didn't know she had made the team as a walk-on until the coach asked her to fill out a form for the media guide. Mike graduated from Punahou and almost followed Mia to UCLA but received a better offer from Stanford. Debbie, another Punahou grad, joined him in Palo Alto, Calif., a year and a half later. "For her (Debbie), the experience is different on some level," Mia said. "There are some of the things she didn't have to think about because of some of the awareness that was created from Mike. "When people found out that he had a sister that played volleyball too, then people's eyes would light up. She definitely benefited from that in terms of getting the colleges to notice." The path may have been a little easier for Mike and Debbie but rings were a different story. "Mia got her ring first. And then Debbie got her ring and then another ring and then another ring," Mike said. "I was the only person in the family without a ring. The pressure was on. I was very relieved for many reasons. Finally, I can add to the treasure chest." One of Debbie's rings came in handy for Mike when Stanford defeated UCLA for the NCAA title in 1997. The littlest Lambert gave Mike her ring as a good luck charm and Mike put it under his pillow and slept on it before the NCAA final. Stanford and UCLA battled in an epic five-game match and when it was tied midway through the fifth game, Mike pointed to the stands at Debbie and told her he was getting a ring. The Lamberts have never compared their rings in part because they were hardly ever in the same place at once. Until recently, they were spread all over the globe with Mike playing professionally in Italy and Debbie working in Buenos Aires, Argentina. Now all three live in Los Angeles and Mike is focused on playing beach volleyball with the Association of Volleyball Professionals. "It's kind of cool that we're still growing with each other and getting to know each other as we engage in different chapters of our lives," Mike said. "I feel really good about the tightness. It's a cool vibe for sure." Being centralized makes visiting easier for their parents who still reside in Kaneohe. Vic and Hai Cha have traveled everywhere to see their children play. Between final fours and Olympics, they haven't missed much. "It's been a reason for us to travel, a good excuse you could say," Vic said. "We had to kind of wean ourselves from that. It's just difficult. It's something we've enjoyed doing."